The more Ben and Amelia learn, the more Amelia’s father’s claims appear to be accurate. In fact, it’s probably worse than he realized. Even Ben is beginning to wonder if he’s become a pawn in the workings of a corrupt empire. But Great Western isn’t about to stand for a female reporter and one of their own men bringing down their lucrative schemes. Working against time, and never knowing what danger lurks around the next corner, Ben and Amelia set out to reveal all they’ve discovered before Great Western silences them for good. When I received the book in the mail, I was excited as a newsgirl with a new printing press, but at the same time I was a nervous about whether I’d actually be able to understand the wording used in the novel. Both the cover and the synopsis led me to believe that only persons fluent in business & newspaper lingo could comprehend what was happening; luckily, I’d assumed wrong. Turns out the writing style is similar to every other Christian Romance out there based in the West, and I zipped through the book easily. 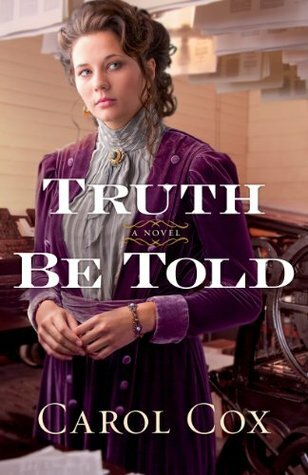 Amelia Wagner is a wonderful heroine: she is a strong, beautiful woman who believes in the Lord, knows right from wrong, and isn’t afraid to take on the job of her heart, despite the fact that not many would believe that a woman could successfully run a newspaper. However, what I loved most about her is that instead of giving into her mother’s pleas to come back to Denver like many girls of the time period, Amelia was smart enough to realize the real reason she was wanted back, and to put herself and her safety before running blindly back to her society-craving parent. However, even dear Amelia wasn’t perfect. The main thing I didn’t appreciate about her character was how she dealt with Homer, her and her father’s longtime friend, and the man who worked on the newspaper with her. After her father died, I feel that Amelia spent too much time staring at her father’s notes on the Great Western Investment Company instead of helping Homer get out each week’s newspaper and dig around for some news. She sounded apologetic all the time, but she barely ever did anything to help him. Then, when the pressure of doing all that work – combined with the death of Amelia’s father – led him to turn to drink, Amelia kept pushing off asking him about it, instead trying to solve her mystery. It bugged me that she wasn’t as thoughtful a person as her father, and that she was too focused on proving to herself that her father was right to take notice of those around her. Nonetheless, I believe these faults of hers were essential to the plot, especially since it was during several of these times that she needed the Lord’s help most. I liked that the mystery was intriguing and business-y, without going overboard and confusing the heck out of me, like I’d originally feared. Indeed, it was actually quite cool seeing the bad guys of the “olden days” and watching them go about their underhanded ways. The side villain in the story was actually the worst in my opinion: I shudder every time I think of him. My favorite part of the story was definitely the ending though, with the “damsel in distress” scene. It was also hilarious how the three times Ben and Amelia tried to kiss each other, they were always interrupted. And of course, there’s the argument between the two that gets everything out in the open; I thought I’d enjoy the scene like I do in many other romances, but this one broke my heart. Definitely not something I’d expected.